Do you want to help save an animal's life, but are unable to adopt at this time? Consider sponsoring an animal, to provide life-saving care, or TNR for a colony who is reproducing at an alarming rate, and whose population is out of control. With your donations, we will be able to provide advanced treatment to improve the quality of an ill or injured animal's life, or we'll provide TNR to a feral cat colony in a badly needed area. Unless we are able to raise enough money, the animals below may not get the urgent attention they need. Please help by making a directed donation for these special cases of "nobody's pets", who are likely the result of the financial crisis we are facing in our country today. This is truly what animal rescue is about. 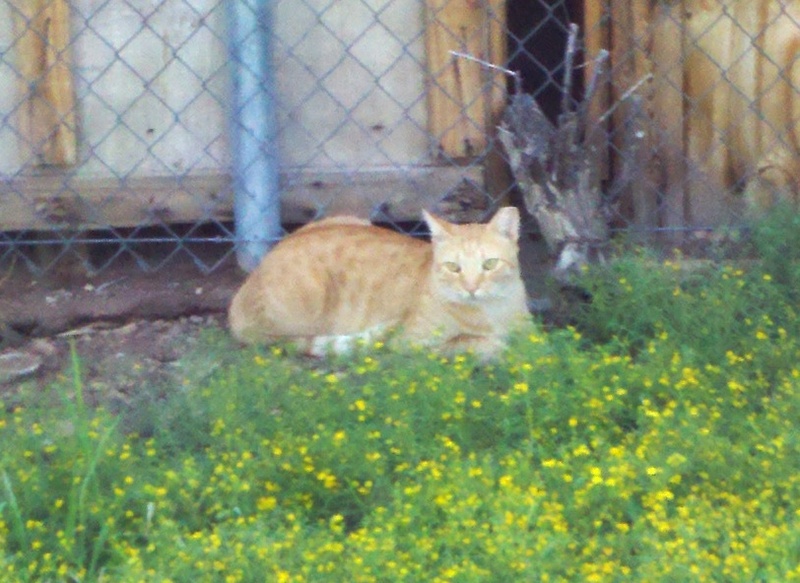 Orange Crush is a healthy, young, neutered community cat, adored by all! He has a tumor in the ear canal that festers and collects bacteria and debris, causing him discomfort. It's sitting right on the ear drum, so it needs to come out. The tumor can be removed, but it's a delicate and costly procedure. He is worth it! We've found a caring and experienced vet who will help Crush for about 1/3 the cost, and a caretaker willing to provide post-op care for a few weeks. We hope you'll chip in so that we can bring Crush some relief! Crush is the fatherly type to all the cats in his colony (we've fixed 48 cats out there!!!). Three years ago while capturing all those kittens, Crush would call out to them for breakfast and dinner when we'd show up. They'd hear his calls, and come out from hiding. When we trapped Panda and Kelly a few weeks ago, Crush was in the garage recovering from the initial procedure to clean and diagnose the ear tumor. He knew their scents, and started calling to them immediately! All the cats in this colony rub all over him, and adore him. Crush deserves to live a long and happy life and fulfill his purpose with all of them. Curious George sustained a severe spinal injury as a kitten, and has steadily developed constipation issues as a result. He suffers from megacolon and recently George needed help fast! He was crying in pain, and guarding, not wanting to be touched. He was in real trouble, and could not wait until morning for help. We had to rush him to the Emergency Hospital where he spent the night and had an emergency procedure. That hospital stay cost $1133, plus follow-up care from his regular doctor. Unfortunately, our little monkey will probably get progressively worse, requiring urgent and costly care again and again. He will always be under a doctor's care. Please consider helping to sponsor George's special medical needs. Willie came running to the food bowl, meowing loudly, skin and bones! The caretaker knew at once he was not feral, though he had the classic large head and jowls, very narrow hips, and scratches and scars on his head and ears. But she also knew by looking at him, that Willie was not healthy, and could barely see out of his goopy, crusted eyes. To prevent the spread of disease to the resident cats at the colony, he was removed immediately. 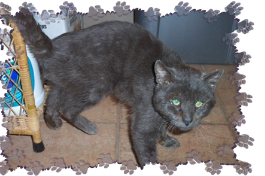 Willie had a viral infection in his eyes and upper respiratory system, and was severely dehydrated. He also tested positive for FIV, known as "Kitty AIDS". Willie was as starved for human affection as he was for food. How could anyone have left such a loving cat to fend for himself? Did they know how he would end up? Did they care? Thankfully for Willie, ALF cared! His health was compromised, but his heart was still filled with promise and hope. After years of abandonment, Willie finally got what he craved for so long - LOVE! filled with quality and dignity. He peacefully crossed over the bridge on August 26, 2010. Donations will be accepted in his memory. Rest well, dear sweet Willie. 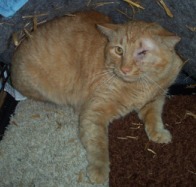 Pirate, a feral cat found with a horrible eye injury, is completely recovered. You may recall we found him with a large, black eye that had begun to prolapse and rupture. The vet couldn't save it, so the eye was removed, and he later developed an infection on the incision. Finally, after a long period of recovery, Pirate was returned to his colony, neutered, of course! Since there are some dairy farms in the area, we think he may have been kicked by a cow. your donation will be tax-deductible. 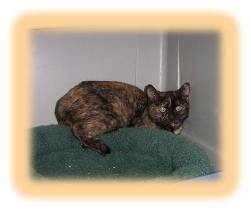 Beautiful Cassidy Needs Sanctuary Sponsorship! This gorgeous kitten was seen hopping along on 3 legs at a local shopping center. At first we couldn't tell if she even had all of her legs, it almost looked like something had been wound tightly around her back legs and tail. We tried to capture her for over a week before we were successful! It was really painful to watch her movement as she tried to run in a panic. We desperately wanted to get her off the concrete and gravel, and provide her a safe place to heal. Each night as we'd head home without her, we would hang our heads, shed a few tears, and say lots and lots of prayers. Finally we caught her, and could see that her left rear leg stuck out in front of her, straight from the hip. She's also missing about half of her tail. X-rays show that the leg was broken long ago, while Cassidy was a small kitten. 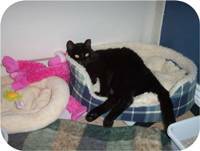 She was likely hit by a car, damaging her left leg and tail. The upper and lower leg bones are only connected by soft tissue at this point. The smaller bones stopped growing, resulting in a shorter leg. Since no wounds or abrasions exist, and the leg is non-weight bearing, the vet determined that amputation isn't necessary at this time! She likely is no longer painful. Cassidy is now in the care of Pawsitively Cats in Tucson. We're sure they would also appreciate visits and volunteers, as well as sponsorships for Cassidy. Visit them at Pawsitively Cats. We're happy to report that her caretaker and Foster Mom has decided to formally adopt Willow! Congratulations Willow and Karen! Willow suffered some type of trauma to her back, apparently hit by a car. She was found in the parking lot near where she lived in a feral cat colony, dragging her back legs, completely unable to move them. In the first 6 weeks, Willow recovered the feeling in her legs, and is able to bend and straighten them at will. The site of trauma on the back is no longer as painful. But it's been two years since her injury, and Willow still cannot stand, nor urinate on her own. Willow received a series of naturopathic treatments including acupuncture, and experienced some improvement. While it was slow, we believe that she achieved some level of healing. WILLOW IS AT ALL FUNDS RECEIVED! THANK YOU FOR HELPING HER! ALF spent several weeks during the hot summer, rescuing 10 precious lives, and sterilizing the adult cats who produced them. Our volunteers logged more than 180 hours on this rescue alone, and another 300 on socializing these beautiful babies who were born in the desert. We became way too intimate with the natural inhabitants of the desert, especially those who only come out at night. We caught and released skunks on more than a dozen occasions. Among the spiders, scorpions, ants, roaches, rats, bats, owls, skunks, and coyotes, one scared little kitten hid away in the crates much longer than his siblings and mama. Rest assured, we did not give up! Read more about Baby Dillinger and all 10 of the kittens rescued during this mission in our Breaking News Special Edition Newsletter. Our average cost to get a healthy animal ready for adoption is $125. Adoptions are usually handled by one of our partner rescue organizations, and ALF does not receive the adoption fee. In the more difficult rescues such as this, we spend a small fortune on smelly foods to attract the cats out from their hiding places, and specially made equipment for trapping small kittens in confined spaces. Next is lots and lots of kitten food, and treatment for a variety of illnesses. Finally tests and vaccinations, and spays and neuters, prepare them for adoption. Though some of these kittens have been adopted through our partner groups, and others are waiting in adoption centers, we're still caring for a few, and could be for a very long time. Their mama cats are now permanent residents in one of our feral colonies, where we will feed and care for them for the rest of their lives. Your donations, and sharing this page with your friends, are key to enabling us to continue saving lives. Please contribute any amount to the Desert Kittens Fund. 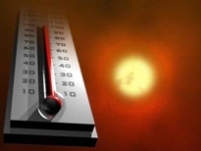 We've met our original estimate of $400 to build an air-conditioned structure. Our greatest needs at present are for medical care for our Special Needs animals. Please help by making a tax-deductible donation to one of their funds instead. If you have any of the following items to help us finish this convalescing/overflow room, please let us know! We're very pleased to have reached our goal and be able to help this colony of cats at the landfill. Thank you for your support! "I looked at all the homeless, neglected, and abandoned pets.. the cast-offs of human society. I saw in their eyes love and hope, fear and dread, sadness, and betrayal. And I was angry. "God," I said, "this is terrible! Why don't you do something?" God was silent for a moment, and then spoke softly, "I have done something," was the reply. "I created you." Animal Loving Friends is an IRS-approved 501(c)(3) charity, assisting free-roaming and unwanted animals in Tempe, Arizona. Rest assured that 100% of every dollar we receive goes directly to the animals and stays right here in our community. We have no paid staff, only a small group of volunteers, who give from their own pockets to care for these animals, without reward - except knowing that they're saving lives with every selfless act. You can reap those same rewards! Any amount you donate will help us to continue to care for the approximately 130 animals who currently depend on us for their survival. Visit our Donate page to meet other animals in need of your help.